Well, I finally feel back to normal after our long road trip. I’ve gotten 13 loads of laundry done, returned our Christmas decorations to their bins in the garage, and cleaned the house. Phew! It snowed a little bit yesterday morning followed by some freezing rain – it was beautiful outside but VERY COLD! School was cancelled due to the weather, so I had one more day with my kids. Most weeks, I try to make some type of homemade treat to stick in the kids’ lunch boxes each day. 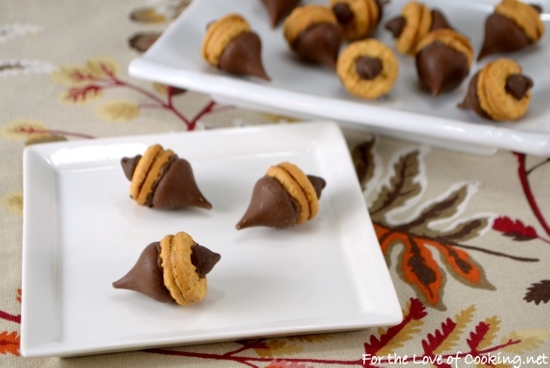 I saw these little acorn treats online months ago and decided to re-create them. These treats are a fun and easy project your kids will love to do with you. Mine both said they are delicious and they think they are super cute too. Place 1/4 cup of chocolate chips in a glass bowl with the 1/4 teaspoon of coconut oil, then put into the microwave for 30 seconds. Remove and stir then place back into the microwave for 10 seconds. Remove and stir until completely melted. If needed, continue cooking for 10 second increments. Be careful not to overcook the chocolate! Dip the bottom end of a wooden skewer into the melted chocolate and place a dot on the center of one side of the nutter butter bites. 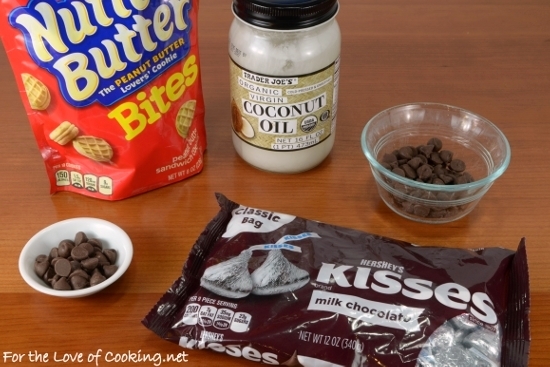 Place the unwrapped Hershey’s Kiss on top of the melted chocolate to “glue” it to the cookie. Place on a plate and continue with the remaining. Place into the refrigerator for 15 minutes to set. Dip a wooden skewer into the melted chocolate and place a dot on the center of the other side of the mini nutter butter. Place a chocolate chip on top of the melted chocolate to “glue” it to the cookie. Place on a plate and continue with the remaining. Place into the refrigerator for 15 minutes to set. 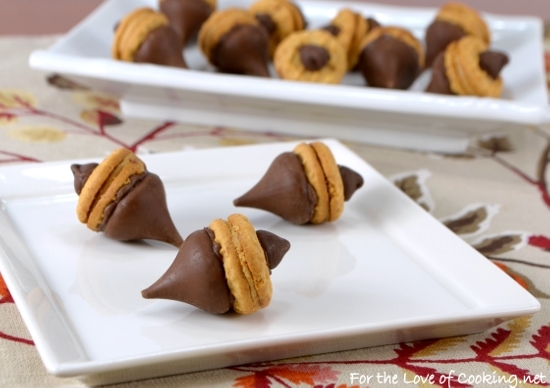 Place the “acorn” chocolate peanut butter treats into a zip lock bag and keep in the refrigerator until serving. Enjoy. What beautiful treats Pam ! What a fun cookie recipe! 13 loads of laundry?? Holy moly! These little treats are so cute!! super cute idea! i love nutter butters and will have to keep a lookout for those bites! Looks great.. can’t believe only 1/4 tsp of Coco oil! So much to do after a Christmas holiday. I know. your treats are very clever. Certainly a kid pleaser. They are really cute Pam. I would not cope with 13 loads of laundry! There is no end to the amount of snacking I would do if these were around! Addictive.